The Honorable Robert Boyle (January 25, 1627 – December 30, 1691) was an Irish natural philosopher who made important contributions to chemistry and physics and established himself as a leading figure in the scientific revolution. Although his research and personal philosophy had their roots in the alchemical tradition, he was an independent thinker who challenged a number of traditional views on such fundamental issues as the nature of chemical elements and their composition. He practiced as well as advocated the experimental approach, regarding it as the key to discovering the secrets of the natural world. Among his publications, The Sceptical Chymist is seen as a cornerstone in the field of chemistry, and he has been called the "father of modern chemistry." At the same time, Boyle was convinced of the existence of God and maintained a firm faith in Christianity. For him, nature and scripture were "two great books" written by the same Author. He regarded the scientific study of nature as a religious act through which one could understand more of the attributes of the Creator. Thus, in his view, science and religion play mutually compatible roles, revealing complementary truths. He called upon others to pursue and become proficient in both. His younger contemporary, Isaac Newton, was likewise committed to both science and religion. Born at Lismore Castle in the province of Munster, Ireland, Robert was the seventh son and fourteenth child of Richard Boyle, the "Great Earl of Cork." While still a child, he learned to speak Latin, Greek, and French, and he was only eight years old when he was sent to Eton College, of which his father's friend, Sir Henry Wotton, was then provost. After studying at the college for more than three years, he traveled abroad with a French tutor and spent nearly two years in Geneva. During his stay in Geneva, Boyle had a dramatic "rebirth" experience through which he made a deeper commitment to his Christian faith than mere acceptance of a religious doctrine. A severe thunderstorm on a summer's night led him to dedicate himself to a sincere and devoted religious life. In keeping with his character, he renewed the commitment on a cloudless, serene day, with the understanding that a promise made in fear was not as serious as one made with calm intention. This promise to God may have led to Boyle's later commitment to the advancement of science for the benefit of humankind. In addition, he later emphasized the need for each individual to have an examined faith rather than accepting a faith on the basis of what one is taught as a child in a believing home. While in Geneva, Boyle seems to have been impressed by a conversation he had with the philosopher François Perreaud. Perreaud later wrote a book titled Démonographie, ou traité des démons, dealing with interactions between the spiritual and physical realms, and Boyle arranged to have the book translated into English. The philosophical and religious ideas expressed therein influenced young Boyle's thoughts about the existence of invisible forces in nature. Such speculations naturally led him to consider the manner in which invisible forces might interact with material objects in the visible world. Boyle remained on the continent until the summer of 1644. Apparently, politics and war made it difficult for him to receive his allowance. Back in England, he rejoined his sister Katherine, who had been a maternal figure for him. Their father soon died, leaving him the manor of Stalbridge in Dorset, together with estates in Ireland. 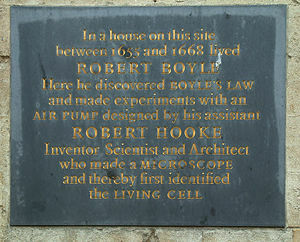 In 1649 at Stalbridge, Boyle dedicated his life to scientific study and research. He soon took a prominent place in the band of inquirers known as the "Invisible College," who devoted themselves to cultivation of the "new philosophy." They met frequently in London, often at Gresham College. Some of the members also met at Oxford, and Boyle took up residence in that city in 1654. An inscription can be found on the wall of University College on High Street at Oxford, marking the spot where Cross Hall stood until the early 1800s. At this site, Boyle rented rooms from the wealthy apothecary who owned the Hall. When Boyle read of Otto von Guericke's air pump in 1657, he began, with his assistant Robert Hooke (1635–1703), to devise improvements in its construction. As a result, in 1659, they produced the "pneumatical engine," or "machina Boyleana," and started a series of experiments on the properties of air. 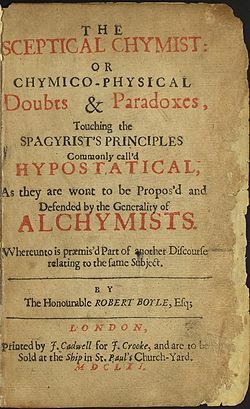 In 1660, Boyle published a book titled New Experiments Physico-Mechanicall, Touching the Spring of the Air, and Its Effects, in which he described his experiments with the air pump. He concluded, among other things, that air has elasticity and weight and exerts pressure. He also reported that sound cannot traverse a vacuum, and air is necessary for creatures to live and materials to burn. On a more fundamental level, his experimental results led him to think of matter as composed of minute particles that he called "corpuscles." Among the critics of the views put forth in that book was a Jesuit, Franciscus Linus (1595–1675). In the course of answering Linus' objections, Boyle enunciated the principle that the volume of a gas varies inversely as its pressure—a principle that is commonly known as Boyle's Law among English-speaking peoples, although on the European continent it is attributed to Edme Mariotte, who did not publish it until 1676. In 1661, Boyle published The Sceptical Chymist as a dialog in which he argued against the blind acceptance of authority in matters of science and demanded that the question "why?" should be addressed in every inquiry into the truth of matters. In addition, he strongly advocated the "proof" of results that are claimed to demonstrate a particular principle. For Boyle, the so-called "new philosophy" was experimental science. His scientific investigations and the sheer volume of his experimental records put him well beyond the philosophical or speculative natural philosophers. It should be noted, however, that his call for "healthy skepticism" in science was not an original idea. It followed similar developments in the history of astronomy and medicine (Bruno, 1989). The revolution in chemistry advocated by Boyle was a call for a systematic organization of experiments and the knowledge gained thereby. His advocacy must have deeply impressed his student Nicholas Lemery, who published a systematic chemistry text, Cours de Chemie. This book was widely used in the study of chemistry for the next 50 years. In 1663, the Invisible College became the Royal Society of London for the Improvement of Natural Knowledge. The charter of incorporation granted by Charles II of England named Boyle a member of the council. In 1680, he was elected president of the society, but he declined the honor based on a scruple about oaths. In 1668, Boyle left Oxford for London, where he resided at the house of his sister, Lady Ranelagh, in Pall Mall. Boyle's health began to fail seriously around 1689, and he gradually withdrew from public engagements. He ceased communications with the Royal Society and advertised his desire to be excused from receiving guests "unless upon occasions very extraordinary," on Tuesday and Friday forenoon, and Wednesday and Saturday afternoon. In the leisure thus gained, he wished to "recruit his spirits, range his papers," and prepare some important chemical investigations that he proposed to leave "as a kind of Hermetic legacy to the studious disciples of that art," but he did not make known their nature. In 1691, his health worsened and he died on December 30 of that year, just a week after that of the sister with whom he had lived for more than 20 years. He was buried in the churchyard of St. Martin's in the Fields, and his funeral sermon was preached by his friend, Bishop Burnet. In person, Boyle was tall, slender, and of pale countenance. His constitution was far from robust, and throughout his life he suffered from feeble health and low spirits. His scientific work procured him an extraordinary reputation among his contemporaries. At the same time, his private character and virtues, the charm of his social manners, his wit and powers of conversation endeared him to a large circle of personal friends. He was never married. His writings are exceedingly voluminous, and his style is clear and straightforward, though undeniably prolix. To Boyle's great credit as a scientific investigator, he carried out the principles preached by the philosopher Francis Bacon (1561–1626) in the Novum Organum. Yet he would not avow himself a follower of Bacon or any other teacher. On several occasions, he mentioned that he refrained from any study of the atomic and Cartesian systems, and even Novum Organum itself, though he admitted "transiently consulting" them about a few particulars. His desire was to keep his judgment as open as possible with any of the modern theories of philosophy, until he was "provided of experiments" to help him evaluate them. Nothing was more alien to his mental temperament than the spinning of hypotheses. For Boyle, the acquisition of knowledge was an end in itself. This, however, did not mean that he paid no attention to the practical application of science nor that he despised knowledge that tended to be used. He had a lot to say about experimenting as a means to gain knowledge about the natural world. In addition, he seemd to have been the first natural philosopher to establish that the suppositions employed in setting up an experiment must be validated before proceeding with the experiment itself. Something in this approach is akin to a mathematician's insistence on fundamental truths (such as the establishment of geometrical theorems) before proofs can be produced. In his written works, Boyle brought together practical and philosophical elements (Sargent, 1995). He demanded that the experimenter think about what he is trying to understand and clarify his methods before starting on the experimental work. In addition, the investigator was expected to devise instruments with which to perform the experiments. For example, he and Hooke had produced a version of the vacuum pump that they used in exploring the pressure and compression of air. In the field of physics, Boyle investigated the expansive force of freezing water, specific gravities of materials, refractive powers, crystals, electricity, color, and hydrostatics. In addition, he enunciated Boyle's law and discovered the role of air in the propagation of sound. For all that, chemistry was his peculiar and favorite area of study. He investigated the chemistry of combustion and respiration, and observed many of the properties of the gas that Lavoisier would later call "oxygen." He also conducted experiments in physiology, but was hampered by the "tenderness of his nature," which kept him from anatomical dissections, especially of live animals, though he knew them to be "most instructing." Boyle was an alchemist in the sense that he believed it possible to transmute matter from one form to another and carried out experiments in the hope of effecting it. In 1689, he was instrumental in obtaining the repeal of the statute of Henry IV against multiplying gold and silver. Nonetheless, he was clearly motivated by the quest for truth rather than by the desire for gold. In The Sceptical Chymist and other works, he rejected ideas inherited from the ancient Greeks, including Aristotle, about the elements of matter being such things as air, earth, fire, and water. Moreover, he criticized the "experiments whereby vulgar Spagyrists are wont to endeavor to evince their salt, sulphur, and mercury to be the true Principles of Things." By these words, he distanced himself from the view of some alchemists (the Spagyrists) that salt, sulfur, and mercury (which were used in treating diseases) were the fundamental principles of all things. In addition, he thought of chemistry as the science of the composition of substances, not a mere adjunct to the physician's art. Boyle advanced the view of elements as the undecomposable constituents of material bodies, and that the elements were ultimately composed of various types of corpuscles (particles) that could not be resolved into smaller parts in any known way. In addition, he understood and defined the distinction between mixtures and compounds, and he made considerable progress in the means of detecting their constituents—an approach that he called "analysis." Given his forward-thinking views and commitment to experimentation, he has been called the "father of modern chemistry." Besides being a busy natural philosopher, Boyle devoted much time to theology, showing a decided leaning toward the practical side and an indifference to controversial polemics. He saw the study of nature through science as an act of worship, or a religious act, because through these studies, people could gain an understanding of the Divine attributes. Some religionists feared the study of nature would lead people away from God-worship and toward nature worship. Boyle, on the other hand, thought of nature and scripture as "two books" written by the same Author and teaching complementary truths. In Some Considerations touching the Usefulnesse of Experimentall Naturall Philosophy (1663), he argued that reason alone leads to the conclusion that the study of God's work will not lead to atheism. Instead, he saw the book of nature as worthy of glorifying God by study. In fact, to neglect the study of nature would be an insult to the Creator. During the English Restoration that began in 1660, (when the monarchy was restored under King Charles II following the English Civil War), Boyle was favorably received at court. In 1665, he could have received the provostship of Eton College had he taken religious orders, but he refused to do so on the grounds that his writings on religious subjects would carry greater weight coming from a layman than a paid minister of the Church. As a director of the British East India Company, he spent large sums to promote the spread of Christianity in the East. He contributed liberally to missionary societies and to the expenses of translating the Bible or portions of it into various languages. In his will, Boyle endowed a series of lectures that came to be known as the Boyle Lectures. He intended them to be a means of defending the Christian religion against those he considered "notorious infidels, namely atheists, theists, pagans, Jews, and Muslims." He added the proviso that controversies between Christians were not to be mentioned. In 2004, The Robert Boyle Science Room was opened in the Lismore Heritage Centre near his birthplace. Dedicated to his life and works, it is a place where students have the opportunity to study science and participate in scientific experiments. ↑ Robert Boyle Life and Legacy Retrieved July 14, 2015. Birch, Thomas (1772; reprinted 1996). The Works of the Honorable Robert Boyle. Cousin, John (1951). A Short Biographical Dictionary of English Literature. Everyman, 1951. Principle, Lawrence M. (2000). 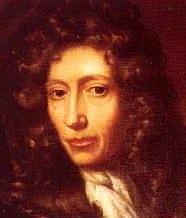 The Aspiring Adept: Robert Boyle and His Alchemical Quest. Princeton: Princeton University Press. Sargent, Rose-Mary (1995). The Diffident Naturalist: Robert Boyle and the Philosophy of Experiment. Chicago: University of Chicago. Shapin, Steven and Simon Schaffer (1989). Leviathan and the Air-Pump: Hobbes, Boyle, and the Experimental Life. Princeton: Princeton University Press. Works by Robert Boyle. Project Gutenberg. This page was last modified on 14 July 2015, at 15:40.